Madness are an English ska band from Camden Town, London, who formed in 1976. One of the most prominent bands of the late 1970s and early 1980s 2 Tone ska revival, they continue to perform with their most recognised line-up of seven members. This six-piece line-up lasted until part way through 1977, when Graham McPherson (better known as Suggs) took over the lead vocals after seeing the band perform in a friend's garden. Dikron went on to be an actor under the name Dikran Tulaine. Smyth, who left after an argument with Barson, was replaced by Gavin Rodgers, Barson's girlfriend's brother. McPherson was kicked out of the band for too often choosing to watch Chelsea instead of rehearsing. Thompson left the band after Barson criticised his saxophone playing. By 1978, the band had allowed McPherson to return, after filling in temporarily for Hasler (who had taken over vocals when McPherson was removed). Thompson returned after patching things up with Barson. Drummer Daniel Woodgate (Woody) and bass player Mark Bedford (Bedders) also joined the band, replacing Garry Dovey and Rodgers, respectively. After briefly changing their name to Morris and the Minors, the band renamed itself as Madness in 1979, paying homage to one of their favourite songs by ska/reggae artist Prince Buster. The band remained a sextet until late 1979, when Chas Smash rejoined and officially became the seventh member of Madness as a backing vocalist and dancer. In 1983, their single "Wings of a Dove" peaked at number 2 in the UK charts, followed by "The Sun & The Rain" (no. 5, November 1983). Their following album, Keep Moving, peaked at number 6 in the UK album charts, and two singles from that album reached the top 20 in the UK music charts. The album received some good reviews, with Rolling Stone magazine giving the album four out of five stars, applauding the band's changing sound. This was an improvement as the last album reviewed by the magazine, Absolutely, was heavily criticised. The band then attempted to record a new album, and 11 demo tracks were recorded. However, "musical differences" arose between band members, and in September 1986, the band announced that they were to split. Barson rejoined the band for a farewell single, "(Waiting For) The Ghost Train", but did not appear in the music video. The band officially split following the release of the single, which reached a high of number 18 in the UK. In 1988, four members of the band – Suggs, Chas Smash, Lee Thompson and Chris Foreman – continued under the name The Madness. After one self-titled album and two singles that failed to make the top 40, the band split. The new Madness song "NW5" (then still titled "NW5 (I Would Give You Everything)") and a re-recorded version of "It Must Be Love" were featured in the German film Neues vom Wixxer in. 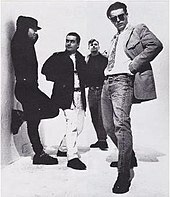 The two songs were released in Germany as a double A-Side, and both of them were turned into music, which – besides members of the film's cast – featured Suggs, Chas Smash, Woody and stand-in guitarist Burdette. A re-recorded version of "NW5" was released as a single on 14 January 2008 in the UK reaching no. 24 – this recording featured original Madness guitarist Chris Foreman, who had rejoined the band in time for the 2006 Christmas tour, but had not participated in the original recording of the song. During an interview with RTÉ 2fm radio host Dave Fanning on 24 May 2010, drummer Daniel Woodgate stated that the members of the band were in the final stages of preparing songs for the follow-up to The Liberty of Norton Folgate. The band hope to be able to start recording the album later on in 2010. From the start of 2013 Mark Bedford increased his performances with the band building to his full-time return to the group, which meant a close to the four years Graham 'Bushers' Bush had spent with the band. On 22 March 2013 the band performed outside the BBC Television Centre in a live broadcast for BBC Four. This was followed by Goodbye Television Centre, a celebration of 50 years of the television centre, marking the closure of the grade II listed building and the last show to be broadcast from it. Following that the band was the closing act to the new year celebration of 2014 in Dublin, Ireland. On 22 March 2014 Suggs confirmed that Madness were writing a new album which he stated "the band plan to record in the summer and release by the end of 2014". In October 2014, Cathal Smyth, aka Chas Smash, took a break from Madness to pursue a solo career. His solo album, A Comfortable Man, was released on 11 May 2015. Madness is continuing with just six members. In February 2015 the band announced the Grandslam tour, taking in 20 outdoor venues. 18 May 2016 - Madness announced their new album Can't Touch Us Now which was released on 28 October 2016, and a tour to follow in December 2016. Lead single Mr. Apples was accompanied by a scripted video (first one since 2009) and A listed by BBC Radio 2. The song Herbert was released as a taster accompanied by an animation video. Further singles Can't Touch Us Now and Another Version Of Me were also playlisted by BBC Radio 2. The album itself entered the UK Album chart at #5. Madness officially opened the rebuilt pier at Hastings on 21 May 2016 with a concert. The Nutty Boys were Lee Thompson and Chris Foreman of Madness. The name "The Nutty Boys" was actually the name of their album, while the new band was called "Crunch!". The posters for their first concert mistakenly listed the band as "The Nutty Boys" instead of "Crunch! ", and the name accidentally stuck. While the members of the band Madness were nicknamed "The Nutty Boys" as a whole, this section lists only the work released by Thompson and Foreman under "The Nutty Boys" name in the early 1990s. Madness collaborated with Elvis Costello in 1983 on a version of their song "Tomorrow's (Just Another Day)". It was released as a bonus track to the 12" copy of the single. In later years, Barson stated that Costello's "Watching the Detectives" was the main influence on the song "My Girl". For Wonderful in 1999, Ian Dury laid down vocals on the track "Drip Fed Fred" which was released as the last single from the album. It was to be Dury's last recording before his death. Ill health prevented Dury from actively promoting the single, although he did appear on the National Lottery Show, but for a later performance on TFI Friday, the song was reworked to incorporate Phill Jupitus on vocals. Live, Madness have collaborated with artists such as UB40 and Prince Buster, notably at their first Madstock concert. They have also played live frequently with members of the other 2 Tone bands, such as The Specials. In May 2008, Suggs and Carl performed live with Pet Shop Boys at London's Heaven collaborating on a new composition of "My Girl". A few days afterwards, Pet Shop Boys posted their own version of the track on their official website. Early in their career, Madness were linked to skinheads; members of a British working-class subculture that the media often stereotyped as racist (although many skinheads, including the original generation, are non-racist or anti-racist). Not only was Madness, along with other 2 Tone bands, popular with skinheads, but it was said that the band members themselves were associated with the subculture. The band's relationship with the skinheads varied at times. Barson was particularly displeased with the band's skinhead association, often finding it disappointing that so many were present at performances. Prior to becoming a full member of the band, Chas Smash had been involved in fights with skinheads at performances. In one particular incident on 18 November 1979, Madness were supported by Red Beans and Rice, who featured a black lead singer, and the band was prevented from completing the performance due to the racist chants from certain members of the skinhead filled audience. Suggs later came on stage to show his displeasure at their behaviour, but this did not stop much of the audience from Nazi saluting at the end of the show. ^ The Fink Brothers were an alter ego created by band members Suggs and Chas Smash. They released a single in February 1985. "The Madness Timeline: 1985". Archived from the original on 28 September 2007. Retrieved 19 June 2007. ^ a b Hall, Duncan (24 March 2015). "Madness still going One Step Beyond as they prepare for Sussex County Ground gig". The Argus. Retrieved 2 October 2015. ^ a b "Alan Gilbey C.V.". Retrieved 7 July 2007. ^ "Madness - Can't Touch Us Now". Madness. Retrieved 2016-09-03. ^ "Ivor Novello awards: The winners". Retrieved on 19 June 2007.